For my in-laws’ 50th anniversary, they invited all their children and grandchildren to join them on an ocean cruise — and they paid the price! It was probably the most lavish gift any of us will ever receive. I’d never been on a cruise before so I explored every corner of the ship. The sheer size of the vessel amazed me. The cleanliness seemed supernatural. But what was really stunning? The fact that, once you paid for the cruise, it was all-inclusive. I mean, we never had to pay for a thing: Not the breakfast, lunches, and dinners we ate, not the comedians, concerts, movies, and Broadway-style shows we enjoyed, not the pools, not the hotel-style rooms… it was all covered in the single cost of the ticket. It was all already paid for by my wife’s loving parents! With joyful gratitude we enjoyed their company at every meal, thanking them enthusiastically for their great gift to us. Think about it. 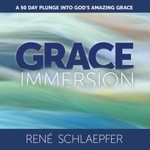 You are saved by grace; you are sanctified (that means the process of growing as a Christian) by grace; you already have “every spiritual blessing in Christ” by grace (See Ephesians 1) ; you are given spiritual gifts by grace; you are enabled to serve by grace; you are motivated to obey God by grace; you are repeatedly set back on track by grace; you are given strength to endure by grace; and finally you are glorified (transformed into your heavenly body) by grace. It’s all grace. It was all already paid for by your loving Heavenly Father. There is no extra charge. Just like today’s verse says! But if you see the Christian life as a gift lavished on you by your loving Father you’ll want to enjoy exploring it and being with your Father out of gratitude and joy — kind of like I enjoyed that cruise! Why is the “all-inclusive” nature of salvation a well-kept secret? Why do you think Christians often slide toward works and away from grace? Pray through the list of things we have by grace from today’s devotional. Thank God for each one of them. Ask Him to help you understand this more.